I’m going to let you in on something that some of you may already know, or at least suspect. There will be another gun-related tragedy in America. It’s not a matter of “if”. It is a matter of “when”. Maybe it will happen in a school. Maybe in some public place like a mall or a church. No amount of outrage will stop it. No amount of teeth-gnashing or fist-pumping will stop it. No rallies or calls for political action will stop it. 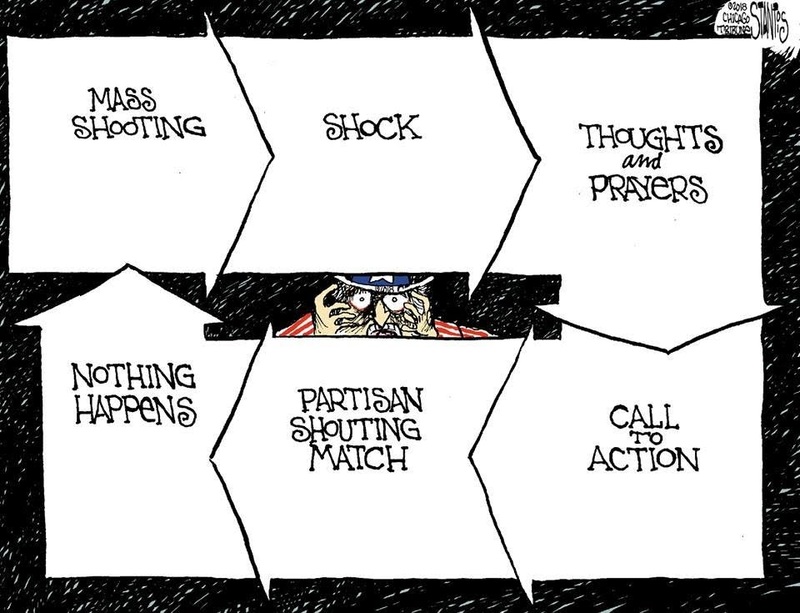 And no amount of “thoughts and prayers” in the whole entire universe will stop that next shooting tragedy from happening. You can take away the “nasty” weapons and restrict how they’re sold and to whom and under what circumstance. You can go after all the violent video games in the world and all of the violent movies available. You can make schools and churches and malls into veritable fortresses with armed snipers on the rooftops and motes filled with alligators, and it will not matter. There will be another shooting tragedy. It will happen because we don’t want to deal with the things that have truly made these people into shooters. I know this segment all too well. I was part of it. I lived it. I tried everything I could to get out of it. And it lingers with me today. It still affects what I do and how I think. And the scary part is that I could have gone down that path. I could have easily been one of those forsaken nobodies that turn their pain into violence and tragedy. What stopped me from going there was the delusional hope that there would be something later on in life that would make up for my misery, and also I came to the realization that going down that path of tragedy would forever damn me in the eyes of society. Everything I suffered, everything I endured, everything I was going through, all the loneliness and isolation and the psychological torment, would become irrelevant if I went from loner to killer. Worse yet, I realized back then that nothing would change if I did go down that path. So I dismissed the whole idea as the fleeting mad fantasy that it is. And now here we are, more than thirty years later, and the madness that I had rejected is being taken up by so many others; in the workplace, in schools, in malls, in public venues, anyplace where they can find people and carry out what they believe to be revenge. Sometimes they die in the process. Sometimes they take their own lives. Sometimes they get captured. And every time it happens, we do the same thing. We go into shock. We give empty “thoughts and prayers”. We lower the flags. 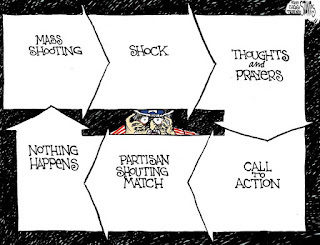 We put the blame on easy scapegoats; movies, video games, secular life, guns. We get mad. We scream for action. And maybe we get some jiffy-pop politically-expedient action if the pressure is strong enough. Something, we believe, is better than nothing. But it doesn’t stop, even if that “something” is done. All the marches, all the legislation, all the pressure on businesses to change their business dealings, all the false idol monuments put up and all the “gun-free” legislation enacted doesn’t change a thing. It just happens again. And it will happen again. And we will be doing the same things over and over again. Because let’s get brutally honest here... as long as we fail to see why these people do what they do and what brings them to that point to where they follow the path to madness and tragedy, then we will never do what it takes to really stop these tragedies. All we will be doing is reacting to the next tragedy. We will be wasting our time and our breath pretending to want something done, when all we are really doing is waiting until the next tragedy happens. What turned people, mostly men, to go down the path to tragedy was not done in a vacuum. They did not wake up one morning out of the blue and decide to be the next monster. There is a flaw in our social structures that resulted in them feeling isolated and forsaken and it is reinforced with every day that goes by that it is not addressed. They won’t open up about it because they have been conditioned to keep their problems to themselves. Don’t complain. Don’t “whine”. Be a “man”. Tough it out! Of course, we don’t want to deal with this kind of problem. We don’t want to mess with the social stratification. We don’t want to admit there are flaws with how things turn out. We’d rather have a few “losses” than mess with the status quo. It’s just that those “losses” are starting to include more than just the “flaws”. This is what we need to deal with, and, as long as we don’t, as long as we play the same game over and over again, then the next tragedy will happen. So the real question that you should ask yourself is how many times will we have to react to the next shooting tragedy before you are truly ready to deal with it?